Using novel metal alloys and magnetic fields Camfridge is creating a new generation of low carbon cooling products that will dramatically reduce energy consumption and use no polluting gases. Camfridge was selected as part of the Cleantech 100 - one of the top 100 private European clean technology companies. During the three days of the Grand Renewable Energy 2018 International Exhibition in Yokohama, Japan, dozens of Japanese companies’ representatives had the opportunity to see and to discuss Camfridge’s advanced magnetic cooling solutions using third generation magnetocaloric materials. 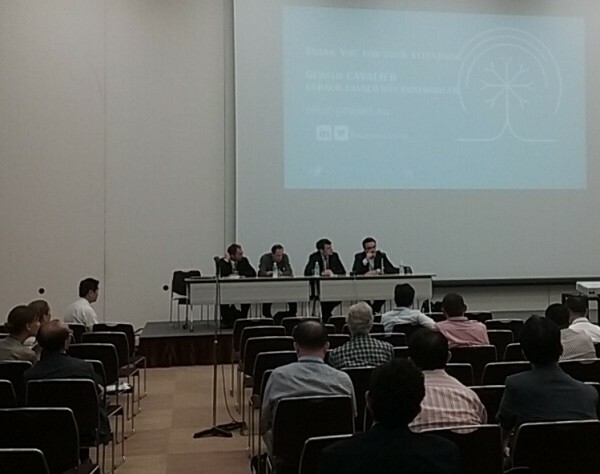 “Japan is a very competitive market and innovation plays a fundamental role for successful companies. This is the reason why the new opportunities offered by Camfridge’s solutions were very well received. What the visitors praised the most was the unrivalled compactness of our technology and the new and innovative uses to which it can be put” said Alessandro Pastore, executive vice President Business Development “The interest was so high that we subsequently decided to install a team in Tokyo who will now be in charge of follow-on. 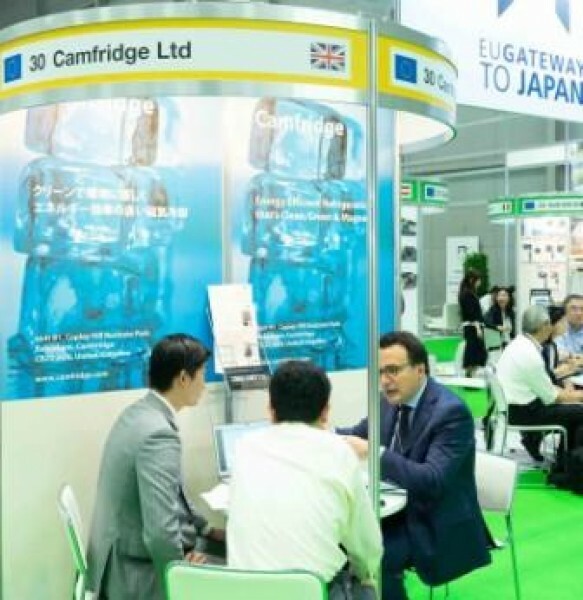 By uniting forces with the right Japanese partners, the first appliances could reach the market soon.” Camfridge was selected by the European Commission to represent the best European green technology companies in the European Commission Pavillon. The “EU-Gateway to Japan” program funded partially the business mission and ensured successful engagement with the Japanese companies. Alessandro Pastore was invited to give a keynote speech on Camfridge to the Venture Tianfu-JingRong Innovation Sharing seminar during the 2018 Chengdu Global Innovation and Entrepreneurship Fair in the city of Chengdu, China on May 18th 2018. 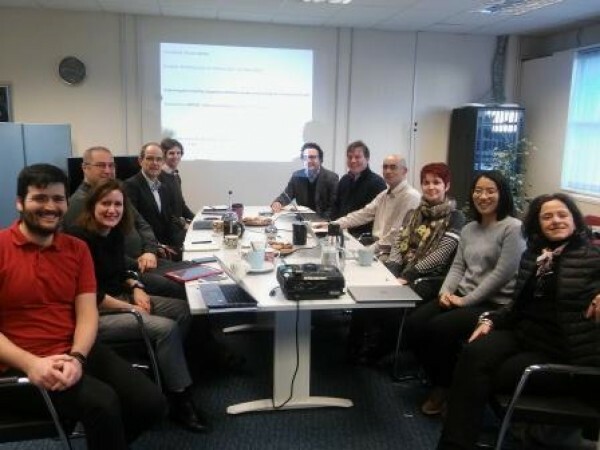 On January 18th 2018 at the Beko R&D Centre in Cambridge the representatives of Camfridge, Beko R&D and Imperial College, i.e. the three partners of the Innovate UK funded 30-month project IMPCOT (IMProving magnetic COoling Technology), had their mid-project review meeting with Graham Dibb the monitor officer of the project and Michael Priestnall the Lead Technologist of Energy Catalyst. The results achieved during the last quarter were presented and discussed as a well as the next milestones agreed. “It is a pretty solid and good plan” said Graham Dibb at the end of the meeting. “The great collaboration spirit among the participants is the key element for success of the project that made possible, so far, to achieve all the milestones” added Neil Wilson the CEO of Camfridge. On January 30th 2017 Camfridge completed its planned capital increase, achieving a fully-subscribed funding round at the maximum target level. This new capital will enable the resources needed to implement the Camfridge business plan in the years to come. “We are delighted at the overwhelmingly response from our current and new investors. They have allowed us to achieve a fully subscribed funding round. Unfortunately I have had to turn a few investors away, such was the enthusiasm for our business proposition”, said Neil Wilson CEO of Camfridge, adding “Over the last few months we have had the opportunity to present our business plan to a wide audience, and today's great result is a testament to Camfridge and its technology; now we can move forward with increased momentum and achieve our goals". On December 31st the 3-year EU FP7 project ELICiT (Environmentally Low Impact Cooling Technology - elicit-project.eu) ended. During the project Whirlpool had the possibility to evaluate the magnetic cooling engine integrated with all the optimized technologies on a in production appliance cabinet (Model RE155A ). Whirlpool stated that the success of the project “is extremely important as it reduces the gap between the research and the production phases”. The cabinet net volume of 142 dm3 was entirely preserved thanks to the Camfridge compact magnetic cooling machine which can be fitted in the cavity at the back of the fridge. 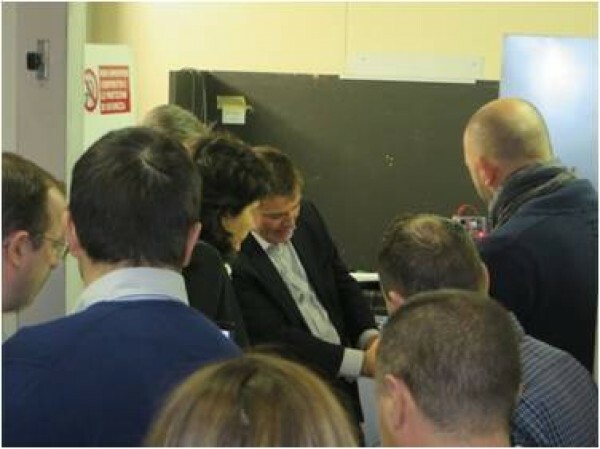 The under-test prototype was also visited in December by Wanda Gaj, Research Programme Officer, DG Research & Innovation of the European Commission and Project officer of the ELICiT project who congratulated all the partners for the great achievements bringing closer to market this high efficient technology. “Camfridge’s mission is not to show a one-off prototype but to develop all the processes necessary to ensure that a mass market, such as the domestic refrigerators market is, can become a reality when high market demand will be there” said Neil Wilson CEO of Camfridge, adding “On the back of the success of this project we expect to generate service revenue growth in 2017”. The recent Kigali Agreement, that will regulate the phase out of harmful HFCs gases globally, created the opportunity to talk about Camfridge's magnetically cooled domestic refrigerator on Friday 14th October 2016 during the daily RAI Science and Technology broadcast “TG Leonardo”. 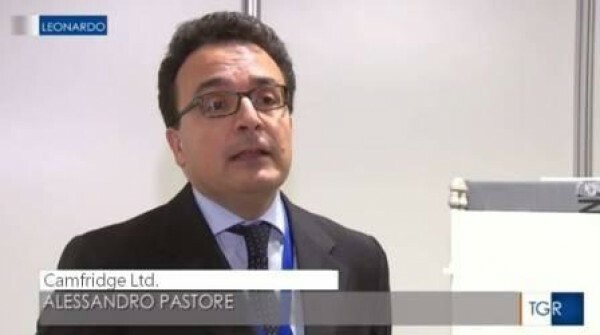 Alessandro Pastore VP Business Development at Camfridge was interviewed. 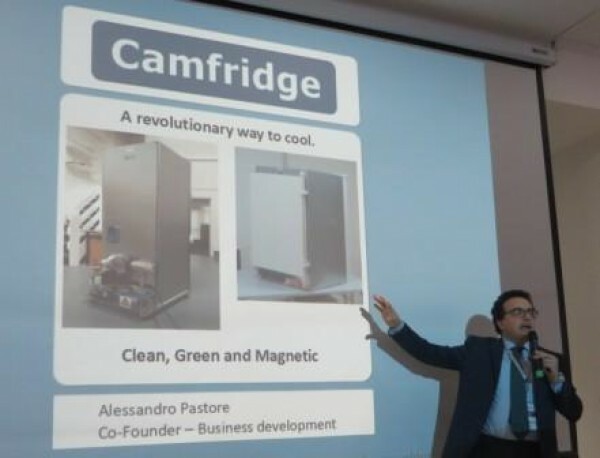 Under the title “The challenge to domestic refrigeration” (“sfida ai frigoriferi” in Italian) Alessandro presented the advantages from both an environmental and economic point of view for fridge manufacturers of the prototype magnetic fridge displayed by Camfridge during the Thermag VII conference, Turin, 11th-14th Sept 2016. TG Leonardo has been broadcast for over 20 years, and has on average at least one million viewers each day. On October 1st a £1.5M project led by Camfridge and partially funded by Innovate UK started with a kick-off meeting in Cambridge. 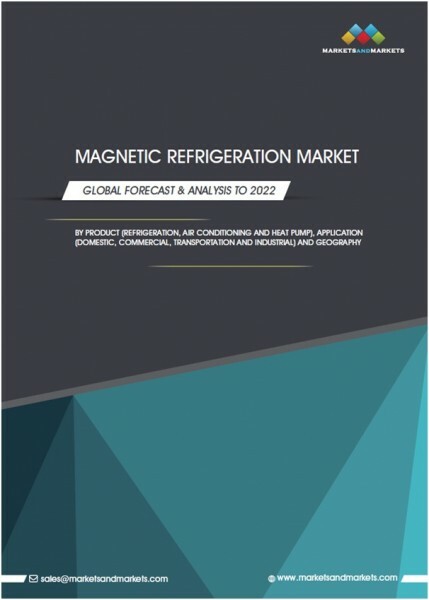 “This project aims to test the longevity and durability of our magnetic cooling solutions. This is the pre-requisite that, once proved, will open the doors for commercialisation” said Neil Wilson, CEO of Camfridge, adding, “Camfridge teamed-up with the leading academic and industrial partners in UK. All of us are thrilled to make magnetic refrigeration the future solution for high efficient and gas free domestic refrigerators”. 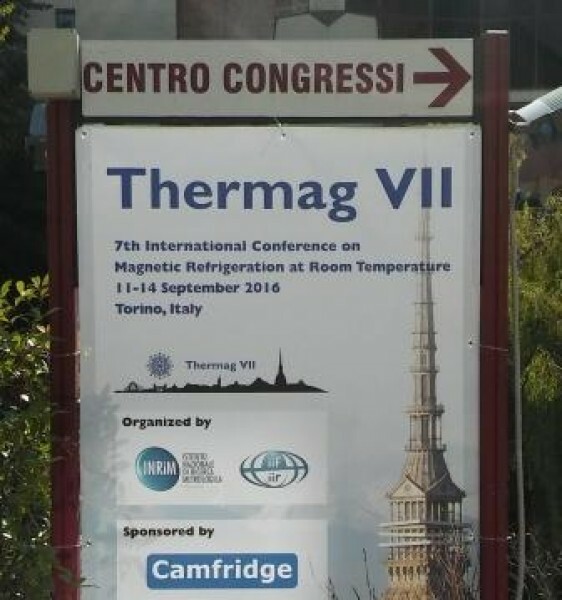 At the Thermag VII International Institute of Refrigeration international conference held in Turin from Sept. 11st to Sept. 14th 2016, Neil Wilson gave a keynote speech titled “Magnetic Cooling at Camfridge : Challenges and Achievements”. The nearly 200 attendees (125 from Universities and research Centres and 72 from Companies) followed the presentation with great interest. An exciting Q&A session followed and continued over the 4 days of the conference at the Camfridge booth where Camfridge showed, for the first time, a domestic refrigerator prototype embedding a Camfridge magnetic cooling engine. The most enthusiastic comments were about the size and the weight of the Camfridge cooling engine, which is the smallest by far in the world and fits perfectly in the back of a fridge. 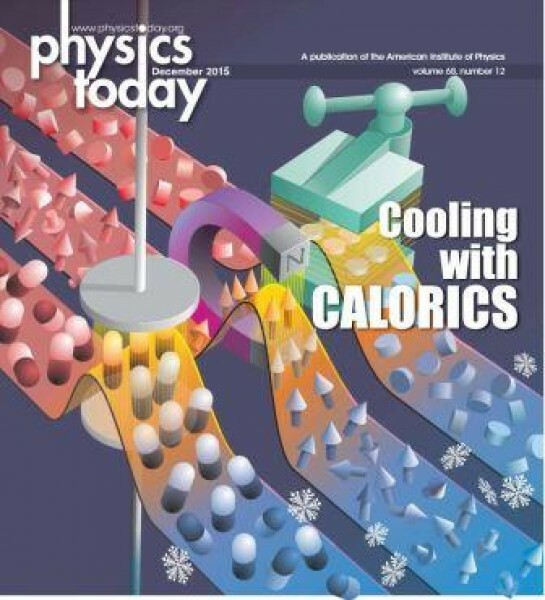 In the December 2015 of the Physics Today magazine Magnetic Refrigeration was the cover story. In the article titled “Solid-state cooling with calorics material” by Ichiro Takeuchi and Karl Sandeman, Camfridge is cited as one of the global players in the field. 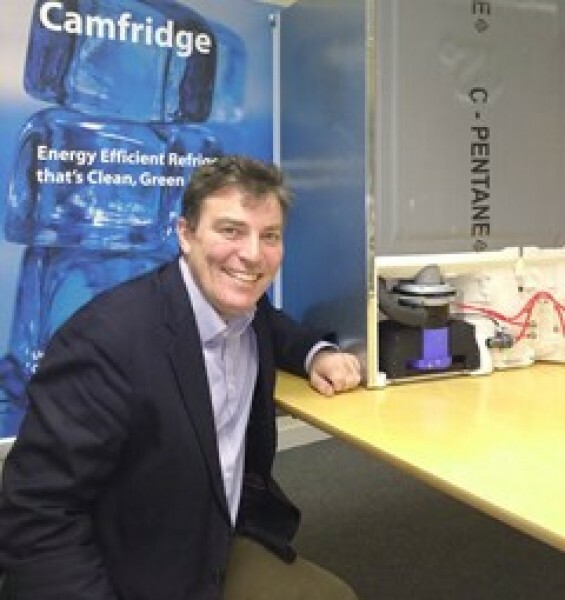 “All the employees at Camfridge are very delighted to see that such a prestigious magazine mentioned Camfridge as one of the global leaders active in the development of this technology” said Neil Wilson CEO of Camfridge, adding “as the article correctly reports magnetic refrigeration is the most well developed technology among the possible solid-state cooling technologies and will be highly disruptive in the near future”. 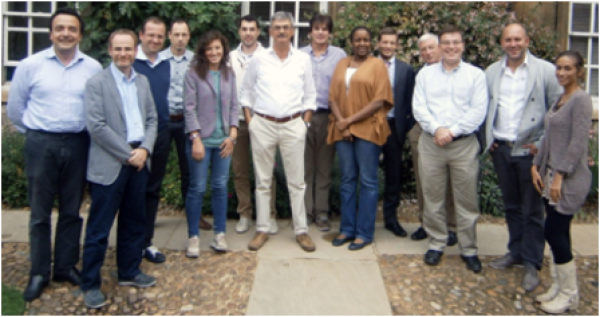 On December 10th and 11th in the iconic Cambridge Union Society building, the partners of the FP7 DRREAM (Drastically Reduced Use of Rare Earths in Applications of Magnetocaloric) project met for the final project meeting. 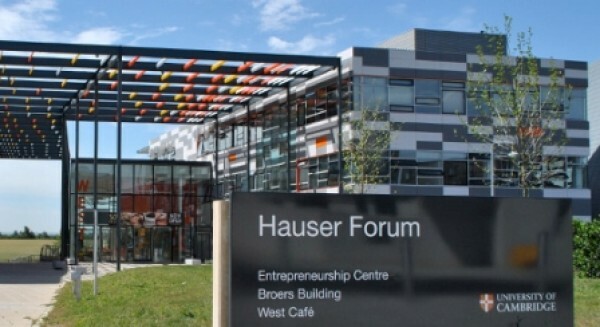 The University town was the right place to present the overall results of the project - the target for the reduction of rare earth elements needed for magnetocaloric material cooling were not only reached, but significantly exceeded. The highly collaborative atmosphere of the project was recognized by all the participants as the key ingredient for this success. Many of the partners will continue to collaborate beyond the end of the project to develop further the industrial production of the magnetocaloric materials used by Camfridge in its innovative magnetic cooling engine. 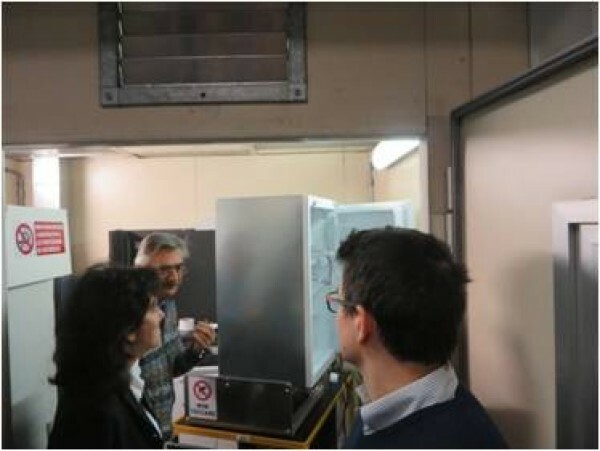 The DRREAM partners had also the opportunity to visit the Camfridge testing facilities (picture) as well as the Camfridge magnetic cooling machine prototypes. 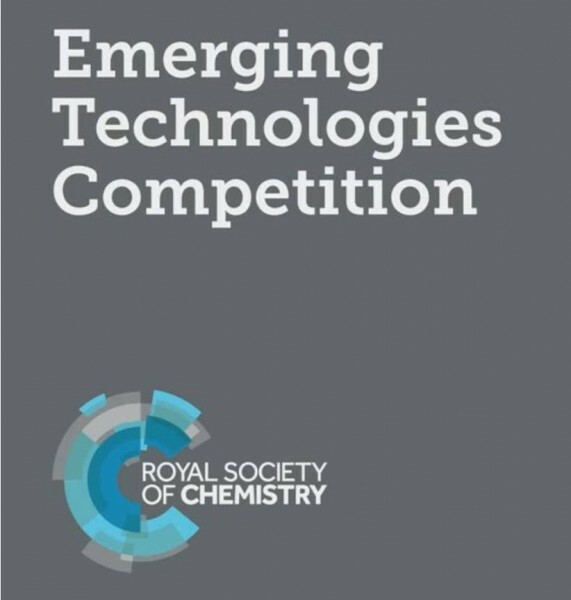 Camfridge is delighted to have been selected by the Royal Society of Chemistry as recipient of its dedicated service called EnterprisePlus for micro, small and medium-sized companies. The service is intended to support businesses active in the chemical science industry that have the power to create solutions to some of society’s biggest challenges – from climate change to beating disease. 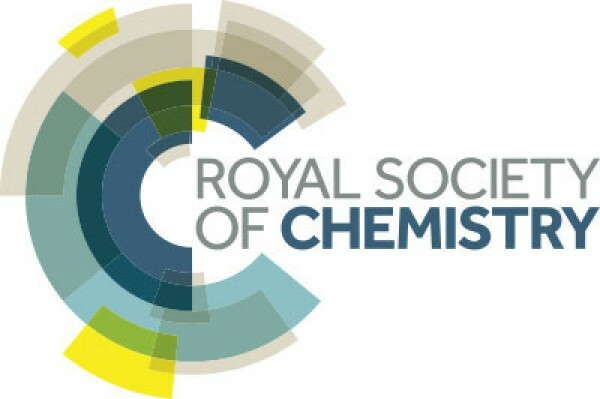 The Royal Society of Chemistry will provide tools to help Camfridge to promote its business, recruit the right people and find the connections, opportunities and resources needed to grow. 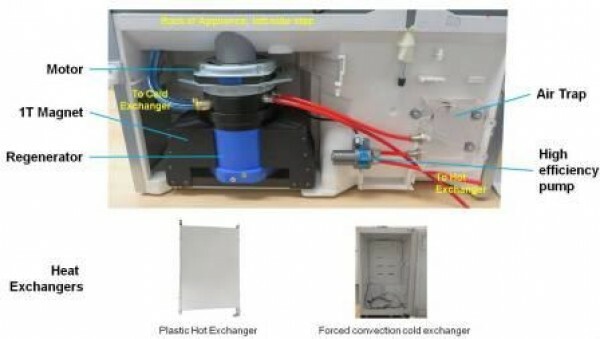 The EU commission website reported on March 24th 2015 an article featuring the importance of the achievements of the SSEEC FP7 project for the development of magnetic cooling technology. Camfridge’s CEO Neil Wilson highlighted the importance of standard manufacturing processes to accelerate the development of the magnetic cooling engines. 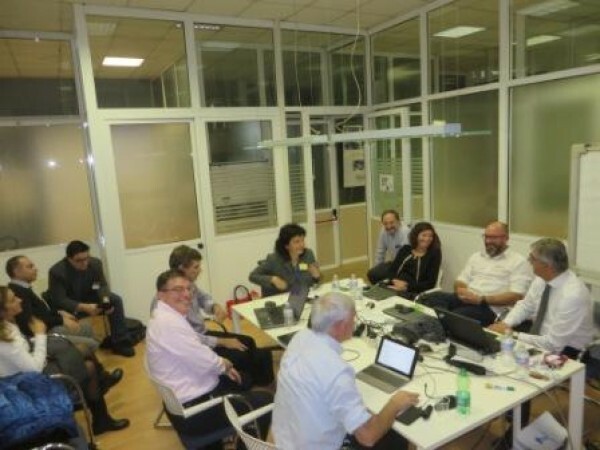 On January 22nd and 23rd 2015, nearly 30 scientists and professionals of the partners of the FP7 DRREAM (Drastically Reduced Use of Rare Earths in Applications of Magnetocalorics) project met in Turin at INRIM for the 24-month progress meeting. Under the leadership of the project coordinator, Prof. Karl Sandeman, the collaborative nature of this meeting ensured constructive progress towards timely achievement of all the project milestones. The comparative studies between LaFeSi based refrigerants and RE-free refrigerants proved highly informative and will likely be of wide interest to the community when published. 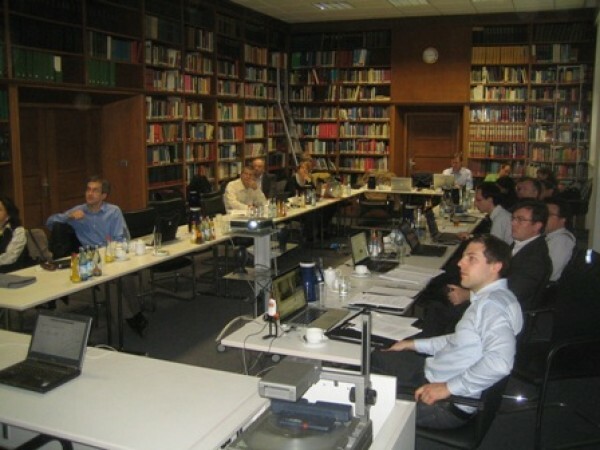 On Oct. 31st 2014, Neil Wilson, Camfridge’s CEO, showcased its magnetic cooling technology to a delegation of senior executives from the leading global soft drinks manufacturer visiting the University of Cambridge. Camfridge's innovative and sustainable cooling solution has a potentially huge and positive impact for the beverage industry seeking to reduce its global CO2 emissions. On September 18th and 19th Camfridge hosted the meeting of the European Union FP7 project at Trinity Hall College in Cambridge. 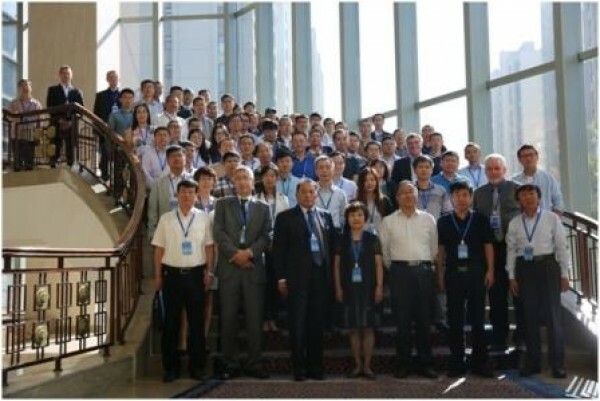 Camfridge's partners in this project include Whirlpool Corporation (a leading white goods manufacturer), the International Institute of Refrigeration (the only inter-governmental organisation representing the cooling industry) and Cemafroid (a market leading standards and testing company in the refrigeration industry). 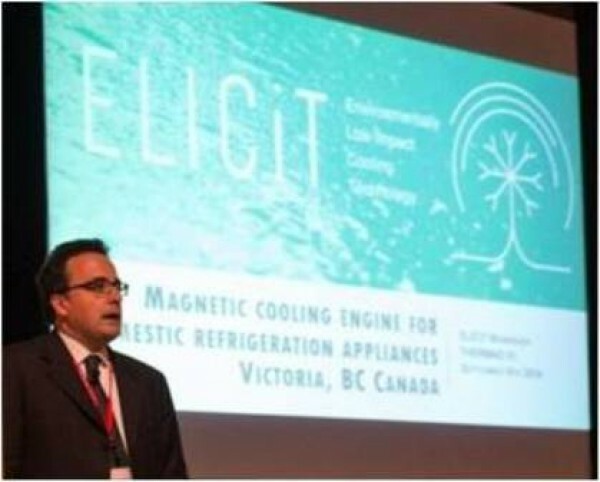 On Sept. 9th 2014, Alessandro Pastore from Camfridge delivered a speech titled “Magnetic cooling engine for domestic refrigeration appliances” at the Elicit Project workshop at ThermagVI Conference in Victoria, BC, Canada. The paper “Magnetocalorics Or Electrocalorics: Will Either Replace the Gas Compressor In High-Efficiency Refrigeration?” by Neil Wilson forms part of the proceedings of the Conference. On August 29th Alessandro Pastore from Camfridge pre-viewed the world's smallest magnetic cooling engine for high-efficiency domestic refrigerators at the FRISBEE Demonstration day at IRSTEA, Antony in Paris. Camfridge received great coverage from the French media and attendees from the cooling industry showed a strong interest in Camfridge’s solution. On June 23rd 2014, Alessandro Pastore presented a keynote speech with the title "A novel magnetic refrigerator" at the final FRISBEE project workshop held during the 3rd IIR International Conference on Sustainability and the Cold Chain in Twickenham, London. Camfridge collaborates with many companies in the packaged cooling-appliance market to enable the integration of our unique magnetic cooling technology into applications. 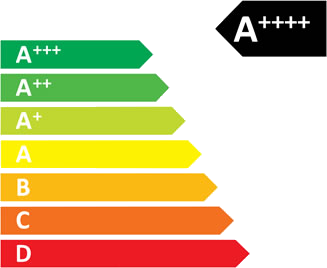 Magnetic technology offers appliance manufacturers a gas-free and highly-efficient solution leading to a highly differentiated product which better meets end-user needs and delivers a unique brand positioning. Camfridge was founded in 2005 as a spin-off from the University of Cambridge, is a private company and has the Cambridge Capital Group and the University of Cambridge and as its principle shareholders. Camfridge enjoys significant collaborative R&D funding from the European Union, and the company is also supported by both the Carbon Trust and the Technology Strategy Board. These funding programs are enabling the development of a strong industrial ecosystem that is driving the sustainable growth of the magnetic cooling industry. Neil founded Camfridge in 2005, having worked for a number of years internationally in France, Germany and the USA for high-growth technology companies and start-ups, as well as undertaking technology consulting engagements with Blue Chip companies and large governmental organisations. 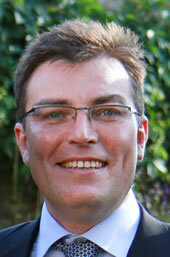 Neil has a PhD in Physics from the University of Cambridge and an MBA from the Collège des Ingénieurs, Paris. Alessandro developed his professional career internationally having worked in Italy, France, Brazil, Argentina and Germany. Before co-founding Camfridge was Vice President at Siemens Communications for 7 years. 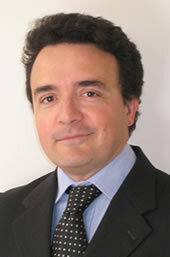 He started his professional career at the Telecom Italia Research Lab. Alessandro has a PhD in Automatic Control from Politecnico di Torino and an MBA from the Collège des ingénieurs, Paris. Camfridge develops energy-efficient and gas-free magnetic cooling - a new cooling technology that use advanced metal alloys and magnetic fields to drive a novel cooling cycle, that can most readily be exploited in domestic and commercial appliances. It is in smaller appliances where conventional gas based cooling technology is less efficient (rather than large industrial scale plants) and it is here that Camfridge's technology demonstrates up to a 40% reduction in energy consumption. Camfridge's immediate market focus is the $20 billion p/a domestic cooling appliance market. Please feel free to contact us about Camfridge's energy efficient cooling solutions. This Site is owned and controlled by Camfridge. The information and data on this Site is subject to revision without notice and Camfridge may revise these Terms and Conditions at any time by updating this notice. All intellectual property rights in and to the site are the property of Camfridge and you agree not to copy, reproduce, transmit, distribute or create derivative works of any part of the Site for commercial gain, nor assist any third party to distribute or commercially exploit all or any part of the Site. In the normal course of browsing through the site Camfridge agree to your printing or downloading to a standalone personal computer extracts for personal use provided both that Camfridge is the acknowledged source including the reference www.camfridge.com and that Camfridge may revoke this permission at any time. Nothing contained in the site shall be taken, construed or considered as a grant of licence or right to use the trademarks of Camfridge. The Site is provided on an "as is" and "as available" basis and Camfridge makes no express or implied warranties or representations in relation to it. This includes, without limitation, any implied warranties or representations of satisfactory quality, fitness for a particular purpose, non-infringement, availability, completeness, security and accuracy. Camfridge shall not be liable for any loss or damage arising from, or in any way connected with, your use of the Site or any information contained or derived from it (even where Camfridge has been advised of the possibility of such loss or damage). This includes, without limitation, any damage for loss of profits, loss of information, or any other monetary loss. Where the site contains links to other websites and resources provided by third parties, those links are provided for information only. Camfridge has no control over the contents of those sites or resources and accepts no responsibility for them or for any loss or damage that may arise from your use of them. whenever you are asked to fill in a form on the website, immediately notify us via email at info@camfridge.com of any restrictions you may have. We are happy to provide you with details of the Personal Information which we process about you. We will require proof of identity from you prior to disclosing such information and will charge a small administration fee in relation to any such requests. 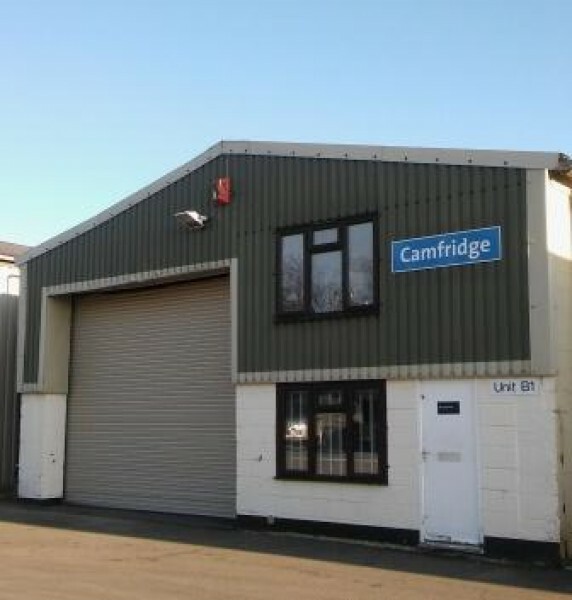 Please direct any such request by post to Camfridge Ltd, Unit B1, Copley Hill Business Park, Cambridge Road, Babraham, Cambridge, CB22 3GN. Please contact us at info@camfridge.com if your Personal Information is or becomes inaccurate and/or out of date.